SCUBA LAB TESTER'S CHOICE WINNER. ATOMIC Quality. Exceeds all expectations. The M1 employs state-of-the-art metals specifically chosen for extreme diving situations. Monel parts are used internally in the first stage for high strength, corrosion-resistance and oxygen compatibility. 316 Stainless Steel, multi-layer Zirconium coated Brass, and Titanium are used throughout the second stage. The M1 valve body is Zirconium/Nickel over Brass and the seat saving orifice is Stainless Steel. The M1 has an expanded performance range to meet almost any diving condition imaginable, whether Recreational or Technical. The M1 is built on the same platform as the world acclaimed T2 and B2 regulators First Stage Specs: Factory ready for Nitrox to 50% or oxygen mixes to 80% when special guidelines are followed. First stage materials are chrome plated Brass for the body and Monel for key internal components. Atomic Jet Seat high-flow piston first stage. Freeze protected factory-sealed first stage also prevents contamination such as silt and sand. First stage ports: 2 HP fixed / 5 LP on swivel cap. Available in DIN or YOKE. Second Stage Specs: Designed for cold water diving featuring thermal heat sink and improved super-dry exhaust valve. Second stage components are made of precision machined Brass with Zirconium plating and Titanium. Patented Atomic Seat Saving Orifice. Patented Atomic Automatic Flow Control (AFC). A new high-flow second stage case lowers breathing effort at any depth from shallow water to beyond the limits. Rapid adjustment knob for manual second stage de-tuning in special situations. Surge protected second stage front cover for high current scenarios. Super-wide exhaust deflector to disperse bubbles for enhanced visibility. Dual silicone comfort fit mouthpiece with tear-resistant bite tabs. 2 year/300 dive service interval. Limited Lifetime Warranty - not contingent on proof of service. 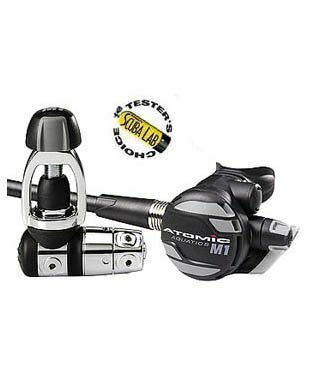 Atomic Aquatics M1 1st and 2nd Stage Regulator The M1 employs state-of-the-art metals specifically chosen for extreme diving situations Factory ready for Nitrox to 50% or oxygen mixes to 80% when special guidelines are followed Designed for cold water diving featuring thermal heat sink and improved super-dry exhaust valve House Of Scuba Is An Atomic Aquatics Authorized Dealer!